Our recipe of the week is Ekuru, a popular traditional Beans recipe. It is also known as Ofuloju/white Moinmoin . Most people are usually complaining that their meals are mostly carbohydrate. However, there are interesting ways to infuse protein (beans) in your diet and this is one of them. Ekuru is made from steamed blended dehulled beans, it is a tad bit similar to Moinmoin. 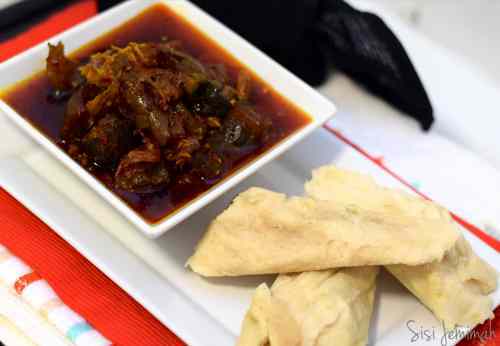 It is traditionally eaten with Spicy Ata dindin (Fried Stew) and Eko Agidi. If you’ve never tried Ekuru then you really are missing out on this awesome deliciousness! 1. First soak and peel your Beans. Then blend with little water till semi-smooth, that’s not too smooth. Do not add too much water, your consistency should not be too thick nor too fluid, kind of in between. Then empty contents into a bowl. 2. With a hand mixer, incorporate air into your Bean Batter by mixing for 10-15 minutes. Mix till very fluffy and frothy. If you haven’t got a hand mixer, you can use a wooden spoon or ladle, mix for 30 minutes. Traditionally, Ekuru batter is pounded in a mortar till fluffy. 5. Steam till fully cooked, this should take roughly 30 minutes on medium heat. **To steam, you can either use a steamer or line a pot with plastic(nylon) bags. Then lift the bag and add water to steam the Ekuru with. Arrange the wrapped Ekuru on the bags; making sure the water can’t get into the wrapped batter. Then, cover and steam. Do check from time to time and top up with more water when/where necessary. Soak the Smoked Fish or Shawa in hot water to clean, then shred into smaller pieces. Also soak the Dried Pepper in hot water for at least an hour. Remember to soak your pepper, don’t just use it as it is or it’ll blacken up your sauce. Then blend the Dried Pepper, Scotch bonnet, 1 Onion and the Bell peppers roughly. Sieve out any moisture through a sieve and set aside….